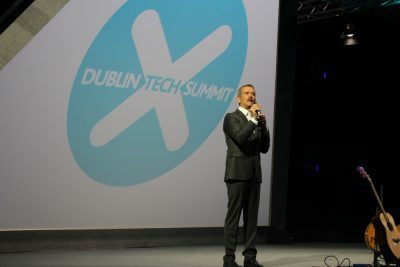 Dublin Tech Summit has closed its doors after its third year of running and its first year at the RDS. This years lineup was as usual very varied; to suit a wide array of interests and resulted in a great draw to its doors. Thought leaders from around the globe descended on the various stages to pass on their gems of wisdom to the waiting crowds. However in this article I want to highlight the Space related people who they managed to bring over from the States and Canada. The Keynote this year was from Commander Chris Hadfield, a Canadian astronaut who as part of his 21 years with NASA was also Commander of the International Space Station and completed 2 space walks among a huge array of scientific tests and achievements. Many people will know of his singing David Bowie’s Space Oddity on the space station back in 2013. The fortunate attendees for the event, again heard his rendition live this time. Before I launch into the end of the event though, let me talk about the two Space celebrities we met the day before. This humble, relaxed and friendly gentleman confidently took the audience through a journey of space history to present day and then went on to briefly outline what to expect come the next (possible) 15 years plus. He brought the room to a complete hush when the images of the Gateway plans went up. This Lunar Space Station will orbit the Moon and be the well needed stop gap they feel is needed to get humans to Mars in the coming decades. I was able to sit down with Douglas later that day and learn more about what’s coming up for technology in Earth science as well as in Space. We discussed Mars 2020 and the tech capabilities that are coming up on that mission as well. He also mentioned that they have a request out for University teams to come up with solutions to fix problems they expect to encouter during the mission. We spent nearly half an hour talking about various matters, please check back next week to learn what we discussed. 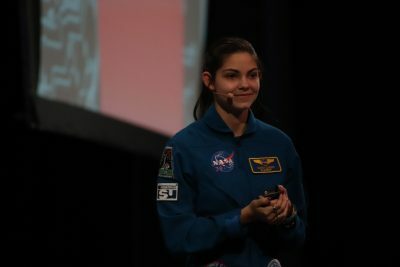 We had the amazing opportunity to interview Alyssa Carson Astronaut in Training for first Mission to Mars at #DubTechSummit today…. Commander Hadfield had a full-to-capacity room hanging off his every word as he explained what extreme leadership meant in the harshness of space. He gave us examples of situations he and his team faced and had overcome. With an excellent visual display of photos from his journey from childhood to present day he explains what motivated him and drove him to where he is today. He also made everyone in the room fully appreciate the tremendous power and speed of space flight by describing in great detail what the “8 and half minutes of terror” really is like for the astronauts aboard the shuttle as they ascend to space each time. His amusing and to the point wit together with his impressive backdrop of images had everyone transfixed. Towards the very end of his nearly hour long talk he picked up his guitar and gave us his rendition of Space Oddity by David Bowie as well. 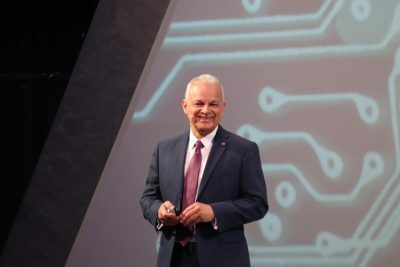 Both Douglas Terrier and Commander Hadfield also spoke later in a talk entitled “Technologies needed for the future, and Value/importance of International Collaboration”. Erin Winick moderated and the audience were given the opportunity to do Q and A as well. Overall bringing these speakers to this years event highlighted Space Tech. With recent announcements from NASA and ESA saying that they will be returning to the Moon in the next 5 years and only this week announcing a woman will be on its mission. Dublin Tech Summit have brought the brightest stars to Dublin this year and have shone a light on its advancements and progress to the wider audience.